In most people’s lives they have used a Coke vending machine more than once. As the world has slowly been going towards energy efficiency there have been many new innovations with Coke vending machines. One of the newest innovations from Coca-Cola comes from Japan in the Fuji electric retail systems company. They have developed a new type of Coke vending machine that is able to keep beverages cold without using power for up to 16 hours a day. This new game changer in Coke vending machine technology not only helps save money it also saves the environment. One of the reasons Coca-Cola had to focus on more energy-efficient Coke vending machines in Japan had to do with the Japanese 2011 earthquake. The slow shift in types of energy use in Japan has had Coke shift its R&D department towards more environmentally friendly and cost-effective vending machines. The system used is called the A011 peak shift. This allows the Coke vending machine to shift the use of its power for cooling from the unusual peak midday to the nighttime. How it works is that all the products and the machine are cooled at night so the rise in the machines temperature is limited even after the cooling has begun to stop for a long period of time. Also the machines vacuum insulated materials help reduce the impact of the outside temperature. The airtight doors also prevent cool air from escaping the machine, which helps reduce the overall impact of outside temperature. This is a good way to save money and save the environment at the same time. Another type of Coke vending machine is a blast from the past antique vintage Coca-Cola soda machine. These type of Coke vending machines are wonderful way to sell a unique Coca-Cola product in a glass bottle. In certain places these types of vending machines are highly desirable and are still very useful in selling glass bottle Coca-Cola. Some people for these types of Coke machines for the nostalgia purposes while some younger kids enjoy the unique variety that a glass Coca-Cola bottle has to offer. These types of Coke machines I started to get restored and are normally sold for around $3000 range. 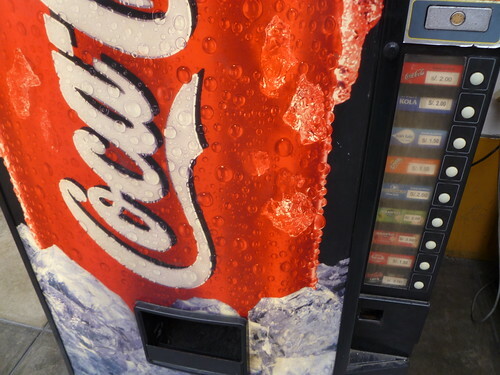 Another type of Coke vending machine is the Coca-Cola robot vending machine in Japan. This robot vending machine walks around Japan in 2011 was just a man in the suit from the Coca-Cola advertising agency Japan. And it was a very cool idea and spawned a lot of interesting height and commercials. The new Coke vending machines are currently doing a check in on Coca-Cola vending machines. These particular new innovation in Coke vending machines allows its customers to check in then choose an avatar that would fit their personality with the use of QR codes. There presently around 400,000 vending machines in the country with QR codes and around 420,000 more machines will be a start with QR codes by the end of 2012. This is part of Coca-Cola’s happiness quest campaign. Of course this QR code vending machine happiness quest is taking place in Japan. Coca-Cola is hoping to fix personalities to different Coke machines across Japan. They’re hoping that by giving each machine its own unique identity it will help people almost develop relationships with these coke vending machines. It is a very unique marketing approach to coke vending machines. Who knows before you know it you might be checking in at foursquare at a particular vending machine with a personality. Overall there are many different types of Coke vending machines out there and these are just some of the brand-new to old-school types.